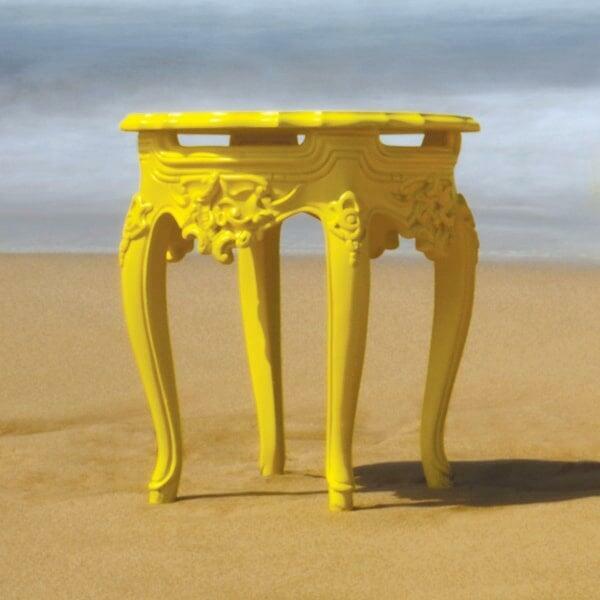 The Lofty Anna Yellow side table is elegant and detailed enough for indoor placement, and durable and resilient enough for outdoor placement. The table is made of multiple layers with varied components. At the core of the table’s frame is steel, which gives an incredibly durable support skeleton. Then, the polyurethane frame makes the Lofty Anna table ideal for outdoor use, with easy maintenance. The light-stone material is made of a special resin that withstands water and humidity completely. This table is so resilient that it could be completely submerged in water and come out as good as new. The style, clearly, is unlike the average outdoor side table. It has magnificent detailing that resembles bygone days of castles and magnificent detailing reserved for individuals of the highest privilege. Now, that same style is combined with a boho-chic vibrant yellow coloring and forward-thinking outdoor and indoor durability.